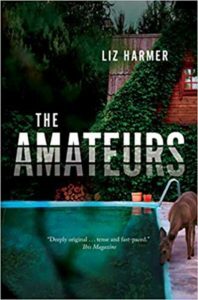 Liz Harmer’s debut novel The Amateurs was published by Knopf Canada in 2018 as part of the Knopf New Face of Fiction program, receiving starred reviews from The Quill & Quire and Publishers Weekly. 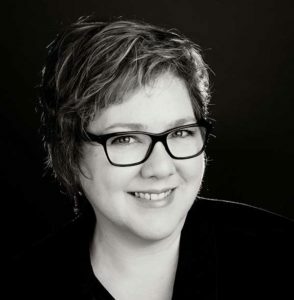 She has also published essays and short stories, including a Journey Prize finalist that was selected for Best Canadian Stories in 2018. Our interview took place by email. Q: Your novel follows the survivors of a high-tech winnowing of humans. One of the underlying questions posed by the book seems to be: what is it about these survivors that causes them to resist the temptations of the ports? What do they have in common? One thing I was thinking a lot about is people who are very late-adopters to technology. I was thinking about the issue of being so-called present in your own life and the way our current phones and internets interfere with that, and how that was a form of portal-travel—how many of us are actually here at any given time? Those of us who are not using smartphones or social media, who don't document our meals or text while driving. I was thinking about those people as having a certain quality that, absent the technology, would not have appeared significant. Like a person who has a mutation that leads to an immunity that isn’t important until a plague hits. Thus, I was thinking of late adoption as a kind of heavy evolutionary hand. Also, the people left behind are ditherers. People who are less ambitious or more present. Less striving for something other than what they have. There's a moment when Rosa is the only one of three not to experience the seduction of the ports, and it’s because she is so in love that she’s immune to longing. But, of course, it's a universal human experience to desire something else. Very few would be immune. Q: What initially attracted you to the concept of amateurism? How did you settle on that as the title and central concern of the book? 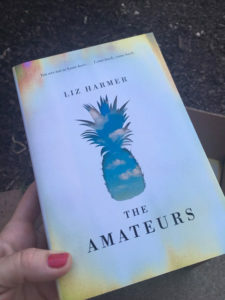 The Amateurs as a title arrived during a class I was taking at the University of Toronto given by a professor—Andrea Most—who had added environmental activism to her career as a scholar of American literature. We were reading several things that were very influential to me and on my book, including the essay by Frederick Turner, which gave me the title and is quoted at the beginning of the novel: "Nature is pathetically willing . . . The flowers growing in the desolation of Mount St. Helen's testify to what in human beings we would call a lunatic hopefulness, the optimism of the amateur." I liked that quote for its poetry, and the sentiment is fascinating, as though nature is unembarrassed to be seen as extravagantly willing, hopeful, optimistic. That quote became a key to me, because I began to think about a kind of miserly professional as the opposite of an apparently silly amateur. The idea of doing things out of an impulse of love rather than a desire for mastery is appealing to me. It was also funny to me to write a post-apocalyptic novel in which nobody has any skills, like mechanical or medical skills. Marie didn't have military training, which she might have if this were The Walking Dead. Aside from gardening and hobby-camping, the survivors know so little about how anything used to work, and the characters maybe prefer thinking about big ideas than figuring out, say, how to make solar panels connect. This is one hundred percent how I would be in the post-apocalyptic sitcom version of my life. Q: Me, too—pretty sure I’d have zero survivor skillz. But as a late-adopter of technology and frequent ditherer, I take some hope from your answer. You’re from Hamilton, Ontario and the city in which Marie and her community are living, the city to which Brandon and Jason return, resembles Hamilton in so many aspects that I was mentally touring it as I read. The city is rendered lovingly—its geography, industry, and buildings, even its highways and gentrification. What was your intention with placing your characters in this setting, whether or not it is meant to represent actual Hamilton? I'm so glad you see that it was rendered lovingly. I love Hamilton, and I was mentally touring it as I wrote. Hamilton to me is almost a city version of the kind of amateur I'm talking about—I think people in Hamilton are in an experimental slightly-to-one-side kind of mode. It feels like a city in which people are trying to invent something, some kind of life, and it also feels like a city that, while not impressive to many outsiders, is beloved of many who live there. I have lived all over Hamilton, gone to school there, mastered its HSR [bus] routes, biked across it, fallen in love, had babies, been hospitalized, climbed the escarpment, waded in Lake Ontario, obsessed about the arts scene, and interacted with people from many class backgrounds there . . .
One great thing about writing The Amateurs was that, since it was my first book, I didn't know if it would be published or be read by anybody. So, I could be outlandish and fantastical. I wanted to imagine squatting and looting in the city I loved, so I did! This question has made me so nostalgic. I don't live there now, but I'd like to go back. For a long time when I lived there, it was in a sensory-rich way—partly because I came to the city after emerging from a sheltered bubble of the Dutch Christian Reformed subculture, so in a way the city was thrilling to me when I found it had been there all along. I was a baby chick, cycling across the city, knowing nothing, admiring trees and buildings, thinking everything was my mother. Gosh, I'm going to write another book about Hamilton, aren't I? Q: The structure of the novel intrigues me, particularly the section entitled "Interlude", which takes the reader on an entirely new jaunt through time and space, following Philip. For me, the effect was expansive—the story opens out, and of course, this section of narrative casts the preceding sections in new light. I felt more compassion for Philip than I had before. It also seems related to the epigraph from Paul Fussell on war. How did this structure, and this part of the narrative, come to you? Was it always there in your conception, or did it arrive later? I suppose this is a long way of asking: plotter or pantser? I am decidedly a pantser, though the exhilarating thing about writing The Amateurs was feeling all the pieces converging as I went. It's the way I write essays, too, balancing an impossible number of things. I like the idea that each moment produces its own inevitability. I think about plot, about desire and action and cause and effect, but I do so in an open-ended and freewheeling way. My experience, at this point, having written some bottom-drawer novels and some more successfully completed ones, is that I really need to find the right structure right away, and then the whole story will be able to unfold. In the case of The Amateurs, that was a structure in which one section pours into another section, kind of grabs the reader, port-like, and deposits them somewhere. I worked on each piece at a time. I also had many false starts. With the interlude section, I did decide about the setting as I was finishing the second section. I knew I wanted to go out into wherever Philip had ended up, and I had a lot of thoughts about the many places in history and in the world where you would not want to end up. I wanted to think about the real cruelty of the possibility that you might, in your romanticizing and nostalgia, choose the worst thing. I had once been very obsessed with the movie Saving Private Ryan, which I think was supposed to be unromantic but didn't work that way for me. I then read some of Fussell's accounts of fighting in World War II. He really de-romanticized the American side and spoke unflinchingly about the kinds of violence people are capable of. Q: Your book will be released TOMORROW in the United States. The Canadian and US covers are quite different—one more abstract, hearkening to the all-important corporation behind the novel's ports, and the other featuring a deer gazing into a swimming pool, which hooks into the story on a number of levels. How much input did you have about the cover decisions? How do you feel about each cover, and why there are two? They are very different! I loved the PINA cover and how it evoked the sense in the story of corporate feeling, as well as nostalgia and decay. However, I love the paperback cover, too. It evokes a different side of the story than the hardcover does. I like your description—"a deer gazing into a swimming pool", which makes me see that cover in a new way. It reflects the way the book is sectioned or kind of two-fold, both corporate inquiry/satire and a post-apocalyptic melancholy. To be honest, I'm not sure why there are two, except that it has something to do with the side of publishing still mysterious to me, though as a reader I have always liked seeing different covers for the same book. My relationship to my own book as an object and as a product, well, I haven't figured out what to think about all that yet. Releasing a book was such a bizarre experience, and to have the opportunity to see it interpreted in these different ways—different covers that show different sides of the book, as well as to have an audiobook coming out—all of that feels so surreal and gratifying. It feels like the book gets a new and continuing life as a result. I had to manage expectations, as all authors do, to figure out how to live with the ups and downs of this and not let them ruin the possibility of making future art. My first copy of the hardcover became my close companion; the one endeared to me because I had read from it in public, but I am glad that the pineapple tattoo I got was temporary. Q: What are you working on now? What's next for you? One project I'm really excited about is a novel, very different from The Amateurs, which is wrestling with the question of desire and trespass, asking what is love, what is lust, can I resist my own ruinous desires, etc. I've also been working on quite a few tragi-comic short stories, as well as a memoir project about mental illness, love, and religious belief. After releasing The Amateurs and feverishly finishing several other projects, I gave myself permission in 2019 to sink into lots of reading, to spend more time with loved ones, and to write in a gentler (to myself) manner. I am very happy to continue to "have it to do," in the words of the great Richard Bausch. 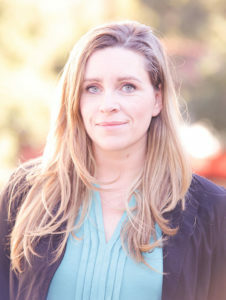 Laura Rock Gaughan is the author of Motherish, a short story collection published in 2018. She lives in Lakefield, Ontario with her family.